In November last year, I decided to colour my hair at home and then I only did I realise the toll that dye can take on your hair. After I washed and dried my hair, after colouring it, the ends of my hair were even drier and more brittle than before and the overall texture of my hair had changed too. Considering these changes, I decided to add a few more steps into my hair care routine to ensure that my hair eventually gets back to its healthy, strong and almost-shiny self. I kept to my normal shampoos, which is Organic’s Straight and Sleek, Milkshake’s Deep Cleansing Shampoo or Head & Shoulders Dry and Itchy Scalp Care, but elected to change up the post-shampooing treatments. 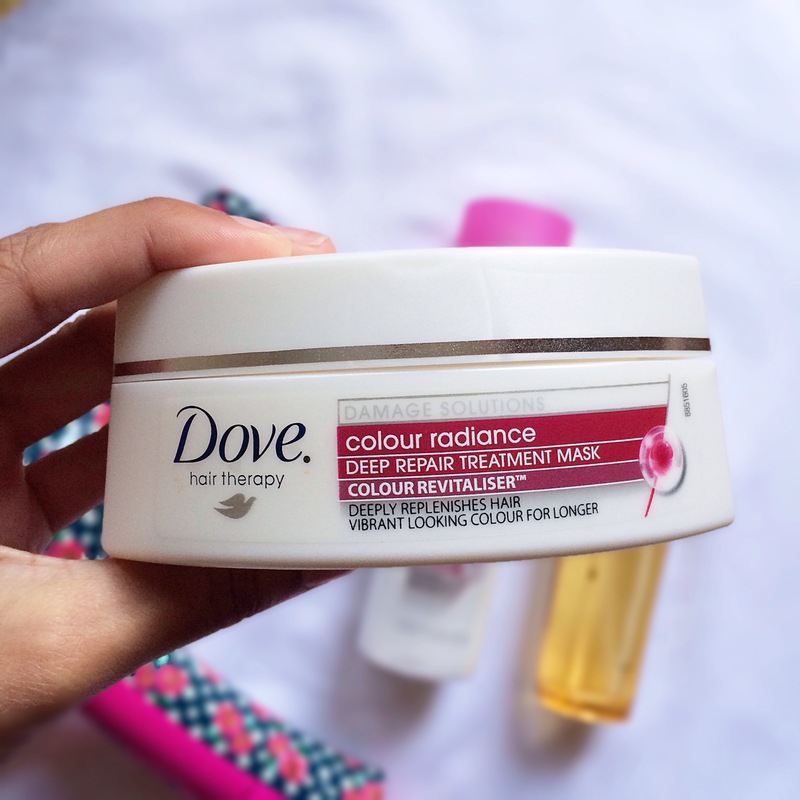 I don’t normally use an in-shower conditioner, but since I’ve coloured my hair I’ve been using Dove’s Colour Radiance Deep Repair Treatment Mask Colour Revitaliser (phew, that’s a mouthful!) as my conditioner/in-shower treatment. Previously, I did use a variant of Dove’s Deep Repair Treatment Mask so I was expecting a great fragrance, noticeable improvement in the hair after drying it and of course the added colour revitaliser – and the Colour Revitaliser provided me with just that. After towel drying my hair, the ends of my hair were less rough and ‘crunchy’ and looked much better than it did before washing. The mask also left a subtle scent on my hair which was pleasant and not too overpowering. After towel drying my hair, I follow up with 6-8 drops of TRESseme’s Oil Elixir for Colour Treated hair, before blow-drying it. I know that 6 drops of hair oil might seem like an exorbitant amount but my hair is really, really long and rather thick too, so 6 drops really is needed. I find that the Oil Elixir really helps in keeping my hair nourished and shiny as well as sealing in all of the good work that the Repair Mask achieved on my ends. I love that even though it is an oil, it doesn’t leave your hair feeling greasy and oily like coconut or olive oil would. The oil is also wonderful as a scalp treatment. Whenever my scalp feels dry or itchy, I massage a few drops of the elixir onto my scalp using my fingertips and within a few hours the dryness and itchiness usually subsides. 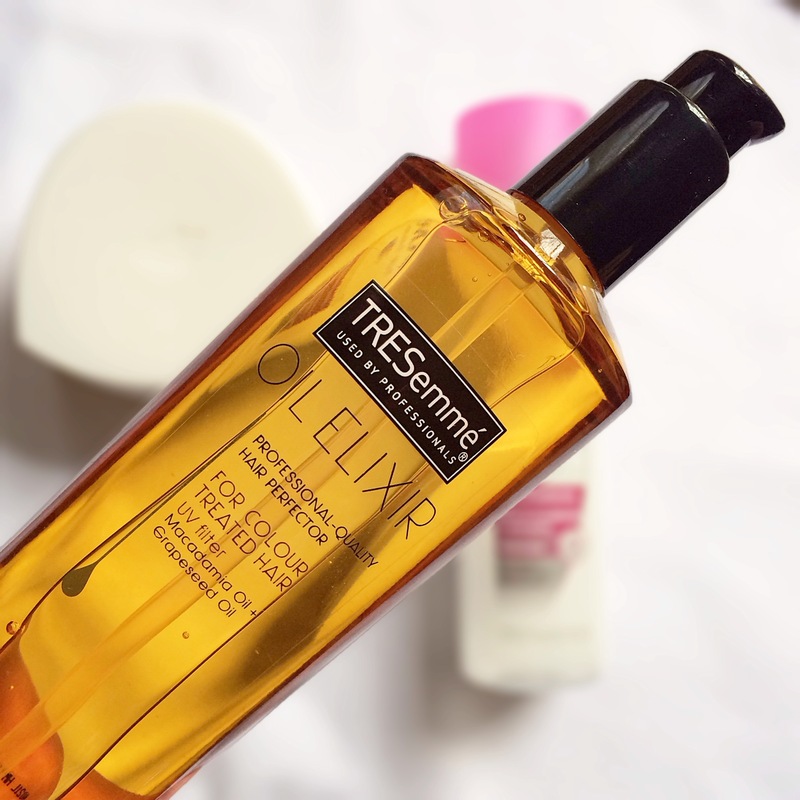 The oil elixir does tend to leave a scent in your hair and even though it isn’t super amazing, the scent is much, much better than that of the not-so-pure Argan Oil treatments that are currently available. On the plus side, the scent usually fades away after a day or so. Even though I don’t show my hair and no one would even know if it looked like crap in-between washes, I’d still know and therefore my hair care routine doesn’t stop after drying my hair. 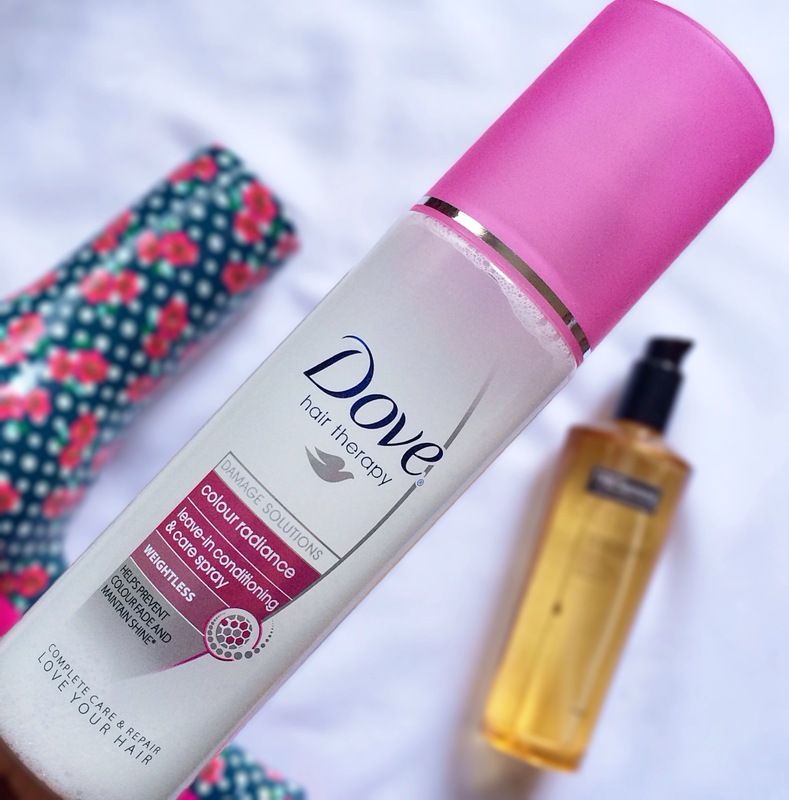 I love using Dove’s Colour Radiance Leave-in Conditioning & Care Spray on my hair, in between washes. It does a great job at revitalising my hair and basically acts like a dry shampoo as it boosts volume and shine and leaves my hair with a soft-to-touch feel. Another aspect that’s great about this spray is that its so easy to use – all you’ve got to do is shake the bottle and spritz the product onto your hair. There is no need to brush it through the hair or even finger comb as it easily absorbs into the hair in like 2 minutes. The fragrance of the spray is, by far, the best from all 3 products mentioned in the post. It has a sweet but clean scent – if that makes any sense – and would basically make anyone believe that your second day hair isn’t really second day hair, but freshly washed hair due to the scent. In my opinion, all 3 products work together harmoniously to provide my hair with best care and nourishment that colour-treated hair requires and clearly my routine has been working for me as it has been over 6 months since I’ve coloured my hair and the colour hasn’t faded yet. The texture of my hair hasn’t returned to normal yet, however it’s quite close – perhaps another few months of this hair care routine will do the trick. Please note that all products mentioned in this post were received for review purposes at some point.